Is your headache from neck pain? Have you ever been halfway through the afternoon and it just starts feeling like your head is too heavy for your neck? Do you wake up in the morning with pain and stiffness in your neck? Do you notice it’s hard to turn and look behind you to check your blind spot when driving? If so, you need to work on your neck! And if you suffer from frequent headaches, you may have what are called cervicogenic headaches. Cervicogenic headaches share many symptoms with migraines – nausea, vomiting, sensitivity to light and one-sided pain. The biggest difference is the involvement of neck pain or dysfunction such as a reduced range of motion in the neck and headache attacks brought on by mechanical causes – pressure on the occipital nerve for example. Medical treatment for cervicogenic headaches is different than treatment for migraines, so see your doctor for testing and diagnosis. Neck pain comes from three different sources: the shoulder, the neck, and the thoracic (upper part) of your spine. These areas all work together – and can have problems together! The shoulder area – on one or both sides – can contribute to neck pain. The neck and shoulder share the same muscles. Many of the muscles whose primary responsibility is to move your shoulder and arm attach to the cervical spine. When these muscles are tight or not working efficiently or with good strength, the neck can feel stiff or painful. The neck’s primary function is to hold up your head and then position your head so you can see. The spine – bones and discs – of the neck has to be aligned properly and the muscles have to be strong and flexible to do their job. Problems with posture and positioning can lead to issues with the mechanics of how the neck functions and cause pain and limitations with motion. The upper back – or thoracic spine – also is a place where many muscles that move your shoulders attach – as well as the place where neck muscles attach. Weakness and instability in this area leads to other muscles having to work harder – and wearing out. Your body tries to adapt with postural changes and often ends up causing more pain and dysfunction. How does my neck pain turn into a cervicogenic headache? One specific type of headache is a cervicogenic headache. These start with problems in the joints in the neck. Many times a headache starts as a tension headache and progresses to this type of headache. Problems with the alignment or posture of the neck can pinch nerves and tighten muscles which then contributes to further problems with the nerves and muscles, causing pain which radiates up the neck and head. Posture needs to be reviewed to determine if the muscles and joints have the best positioning. We often don’t consider how the position of our arms, legs, and torso affects how we move our head and neck. Holding the same posture for a long period of time without moving can cause muscles to tire out and tighten up. Even when we are sitting at home watching TV, our head position and our ability to focus on the TV impacts how hard our muscles are working and whether the joints of the neck are in good alignment to avoid pinching nerves. Stretches can help realign our posture and lengthen tight muscles so they can move more freely and efficiently. A basic tenet of postural stretching is to stretch in the opposite direction of the position you most commonly are in. Sit up straight and hold your head up. Pull your chin in while you keep your eyes looking straight in front of you. This should bring your ears over your shoulder which aligns your cervical spine and lets your neck muscles rest. Studies have shown that people who work at computers all day have less pain and increase their productivity if they do 30 seconds of stretching every 20 minutes. Your neck and shoulder muscles work hard from the moment you sit up in bed. It’s interesting though, that you have several muscles that can do the same movement. And your muscles are made to work in a sequence as a team. If some of the muscles of the team are not as strong as others, this can disrupt the sequencing of movement – and wear out some of the team members! It’s important to have stability and strength in all the muscles so they all can work together. A Physical or Occupational Therapist can help identify which specific muscles and joints are not working at their peak. They are experts in looking at posture, flexibility and strength and developing individualized programs to help the body work at its best efficiency to decrease pain. An experienced therapist can help you look at your posture in activity and make recommendations to help adapt to cause less stress on your body. I am a Certified Hand Therapist (CHT) with 31 years of experience in the field of Occupational Therapy. As a CHT, I have specialized training in the treatment of conditions of the shoulder, elbow, wrist, and hand. 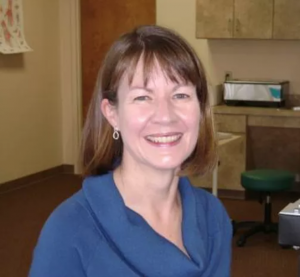 I have extensive experience in treating and providing patient education in common disorders including arthritis, carpal tunnel syndrome, tendonitis, lateral epicondylitis, frozen shoulder, and rotator cuff tears. I believe in not only providing treatment for the immediate problem but educating the client to improve body mechanics and symptom management for long term quality of life. Do you suffer from cervicogenic headaches? What do you do to relieve the pain? 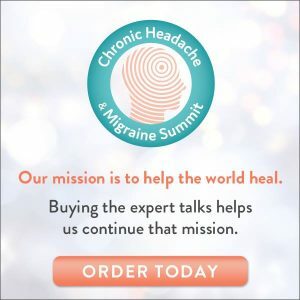 While the medical diagnosis and treatment for cervicogenic headaches is different than common migraines, the systematic method we teach for calming the nervous system and excess inflammation holds true. 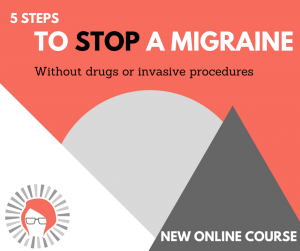 Our flagship course, the Ultimate Migraine Relief course will show you how to use natural methods in the most effective way to get fast relief. Ah, I’ve been having so many headaches lately, but my neck and shoulders have also been very sore. I didn’t think that maybe they’re connected somehow! I’ll have to go see a doctor about it. Check to see if your state allows you to have direct access to a physical therapist or occupational therapist. if it does that means you do not have to see a physician for a referral prior to seeing a physical therapist or occupational therapist who can be the ones to help you! I massage the shoulders/neck muscles every so often. It sometimes helps! This is such great information! I suffer from migraines and have never really thought it could be my neck causing this issue. I’m so glad I found your blog! Glad this post helps you! I wonder about these. I called them tension headaches all my life but it could be this. Gotta check it out. Ever since my car accident 15 years ago, my neck and back have never been the same. I need to go back to the chiropractor soon. Sorry to hear you are struggling. Let us know if there’s anything we can do to help. I didn’t know that there is cervicogenic headache. Thank you for the information. I learned a new thing today. I’ll do a further reading on this as sometimes I experience it myself. Headaches are the worst! These are great tips that are going to help me SO much! Thanks Vanessa. I am glad these tips helps you. Would love to hear an update! I can see how it could happen. One thing off in the body and it seems a headache is imminent. Hmm, this is a new way of checking headaches for me. I’ll trying doing stretching and see if works for me. I don’t get headaches (knock on wood), but my friend does all of the time. I’ll share your post with her to see if your tips can bring her some relief. Thanks for passing this along Autumn. I rub some CBD oil (cannabis) on the affected neck area. I also use a TENS machine to work on both the neck points and also the ones for headache. I also used to (and would like to go back to) using ‘releases’ learned from a fitness instructor, to improve posture.